On this Japanese government map from 1897, Dokdo and Ulleung islands are labeled as Korean territory. Researchers here have discovered an official Japanese government map that identifies the Dokdo islets as Korean territory. The latest discovery adds to a mounting body of evidence debunking Japan's flimsy colonial claim to the Korean islets that is increasingly being pushed in Japanese school textbooks. Prof. Yuji Hosaka of Sejong University said Monday the map from the Japanese Agriculture and Commerce Ministry from 1897 "clearly identifies Dokdo as part of Korean territory." 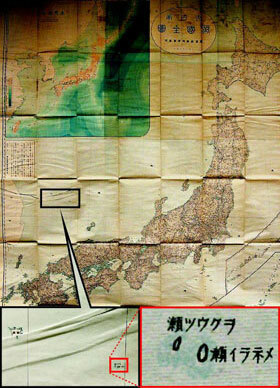 Hosaka said most proof so far has come from civilian maps, but this is the first government map that has been found. The map shows Dokdo and Ulleung islands along with other Korean territories and refers to them by their Russian names instead of Japanese ones. In contrast, the map identifies Taiwan as Japanese territory because it was under colonial rule at the time. "When Japan annexed Dokdo in 1905, the Interior Ministry, Foreign Ministry and Agriculture Ministry played leading roles," Hosaka said. "The Agriculture and Commerce Ministry felt Dokdo was important in asserting Japan's fishing rights." Hosaka added, "Since Dokdo hasn't been included in official Japanese maps, this made it difficult for Tokyo to lay claim to the islets. The discovery of the latest official map clearly shows the Abe administration's claims are groundless."